While Microsoft is still trying to get its arms around Yahoo and its share of the online search and display advertising market, Google has taken one step to closer to consolidation of the online advertising market with the recent EU approval of their DoubleClick acquisition. With its acquisition of DoubleClick and its roughly 60% share of the online display advertising market, Google has now created a dominant market share position in both the online display and search advertising markets. Google’s challenge now remains vertical integration in both markets – greater penetration of search advertising sales within the online brand advertising market and deeper penetration within the small to medium size publishing segment within the online display advertising market. To achieve its objectives in the online display advertising market, Google has announced its new service called the Google Ad Manager. 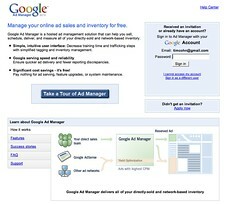 The Google Ad Manager will both allow the small to medium size publisher to greater optimize its advertising inventory yield through access to advertising inventory tools previously only available through DoubleClick while also furthering Google’s pursuit to better serve its primary market – small to medium size businesses – now through the small to medium size publisher. This entry was posted on March 13, 2008 at 10:12 am and is filed under Advertising Inventory Yield, Double Click, Google, Google Ad Manager Service, Google Advertising, Microsoft, Official Google Blog, Online Advertising Market, Online Publisher, Search Engine Advertising, Yahoo. You can follow any responses to this entry through the RSS 2.0 feed. You can leave a response, or trackback from your own site.